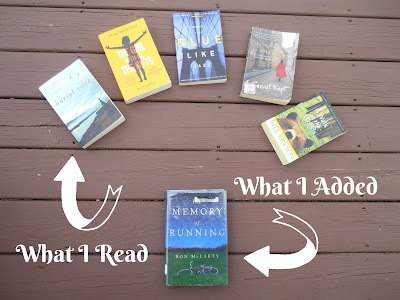 So April was a good month of reading, but I didn't get much else done, including blogging. I started a new job, and now my schedule is 7:00 to 3:30, Monday to Friday. I enjoy getting done at 3:30, and had really good intentions to spend time once I got home blogging and keeping up with some of the other blogs I follow, but unfortunately, I haven't been able to establish much of a routine yet. Instead, I get done with work, run some errands, then come home and read, eat supper, maybe go for a walk with my friend down the street and her dog, and next thing I know it's 8 o'clock and I'm falling asleep on the couch. Still ironing out a routine that fosters blogging time. But anyways, here's what I read and bought. Burial Rites by Hannah Kent was interesting. It takes place in Iceland and is based on a true story. The author did a great job of painting vivid scenes and really showing how a place looked, felt, and even smelled like, but I didn't love it as much as everyone else seemed to. I thought it was a good story, but I wanted to know more about the family that Agnes stayed with, more about Agnes even, but she wasn't much of a talker and a lot of the story took place in her head with her remembering it and retelling it to herself. The Girl with All the Gifts by M.R. Carey started out with such promise. I was enjoying it right up until about the time they ended up on the RV. Then it all started to go downhill. I enjoyed the characters and cared about most of them, and this book is bleak, no doubt, so I wasn't expecting them to fire up the RV, ride off into the sunset, and find the answer to all humanities woes. I was expecting something like Cormac McCarthy's The Road- not a happy ending but not delusional. This book ended in such a strange way. All it made me think is that Melanie may be super smart and observant, but she's still a child or she would have realized that her plan was not only unfeasible to save the one she loved but also cruel. I don't want to spoil anything, but ugh, that ending just annoyed me. Blue Like Jazz by Donald Miller was nonfiction and a good look at how Christians have a tendency to get all wrapped up in this or hat and forget that our main purpose is to love each other. I liked most of the stories and it did make me think. We all have first impressions of the people we meet, but are we willing to dig deeper and see really get to know people. I know a lot of times, I don't engage with people because I think we'll never be deep friends so why bother, but there's plenty of reasons to get to know someone even if you think they're not going to be your new bff. This may seem like a duh thing extroverts but I think introverts are going to know what I mean. A Secret Kept by Tatiana de Rosnay was so disappointing. I loved how the book started, taking place in Noirmoutier and even the little flashbacks were cute at first. Plus there was some big family secret to unravel! Oh my, I can't wait! Well turns out I could have. The secret is not that devastating. The way they were carrying on you'd have thought their mother was some sort of puppy murderer or something. Plus, the main character, Antoine, is this sad sack divorcee who's unsatisfied in his job and can't connect with his kids, and still wants to get back with his ex-wife who left him for another guy. But all that changes when he meets the most remarkable undertaker. Look up manic pixie dream girl, and you'll see this chick. She has an unconventional job, she drives a Harley, she takes the reins sexually, his kids all love her, she never has a bad day apparently, and in turn she turns dumb Antoine's life around, and I couldn't have cared less. I kept hoping this book would get better but it didn't. A Walk in the Woods by Bill Bryson lived up to what I remembered. He goes from giving history of the trail to telling actual tales from his trip. It's a nice balance and makes you realize what an amazing thing the Appalachian Trail is. I don't think I'd ever want to hike the whole thing, but it does make you respect those who do. And Bryson is funny. I laughed out loud with this book several times. 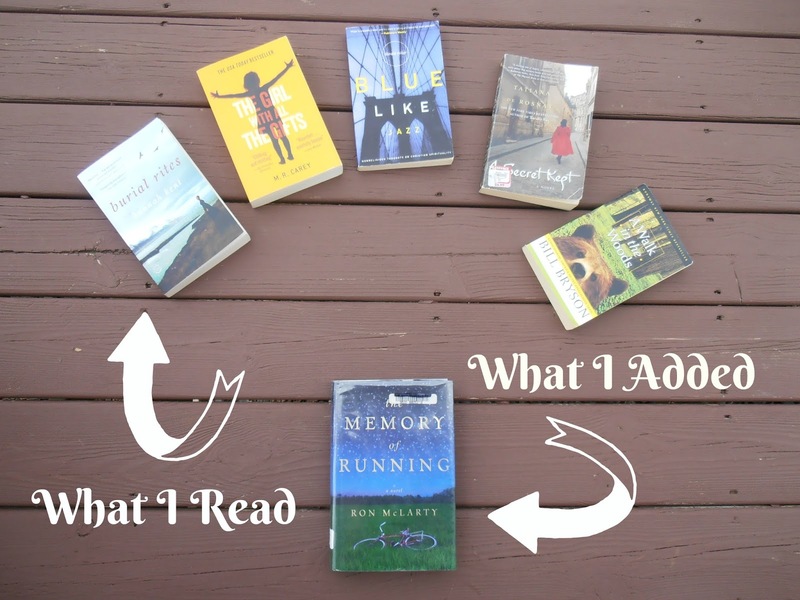 The Memory of Running by Ron McLarty was picked up at my library's book sale. I almost put it back because I'm really trying to limit the amount of books I'm hauling home, but after reading more about it on Goodreads, I am glad I picked it up.